Remember when I said the Holiday Home Tours would begin on Monday? Well, SURPRISE! We are getting this event kicked off a day earlier than planned. I am so honored to introduce you all to my good friend Roeshel from The DIY Showoff as my surprise guest today. I’m so excited that she agreed to show us her holiday decorations. I do want to take a minute to acknowledge the tragedy that occurred in Connecticut on Friday. It has been such an emotionally draining weekend for our nation since Friday morning. My thoughts and prayers have been continuously turned toward everyone involved at the Sandy Hook school, plus prayers for my own four year old son and our nation that is in such a state of shock and turmoil over this. I will admit that I debated really hard whether to even post this series or not. Some bloggers are declaring “days of silence” this week in honor of the victims. While I do not believe that there is a right or a wrong way for anyone to handle their grief over this event, I do think that my blog along with other DIY and home decor blogs can serve as a safe haven from the storm of media horror that can be found in so many other areas of the internet and television. There is nothing anyone can do to turn back time and change the events that occurred Friday, but if you are needing a place to escape reality and take a breather for a few minutes, that is something I can offer to you here. Consider this your quiet place to remove all worry and just enjoy some beautiful photos for a while. 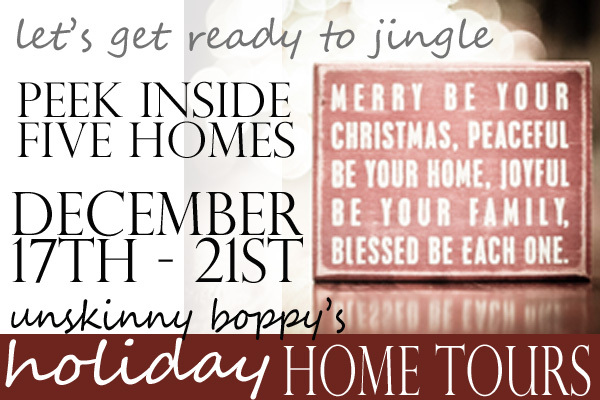 I hope you enjoy this Holiday Home Tour series this week on the blog. There are some truly amazing homes lined up for the tour and I cannot wait to share them with you. Please welcome our first home tour hostess, Roeshel! Hi, Unskinny Boppy friends! I’m so honored to be here today! Beth is such a good blog friend – always positive and at this time of year, her Christmas spirit is contagious! I’m still working around the house, but I couldn’t pass up an opportunity to share our home for the holidays. 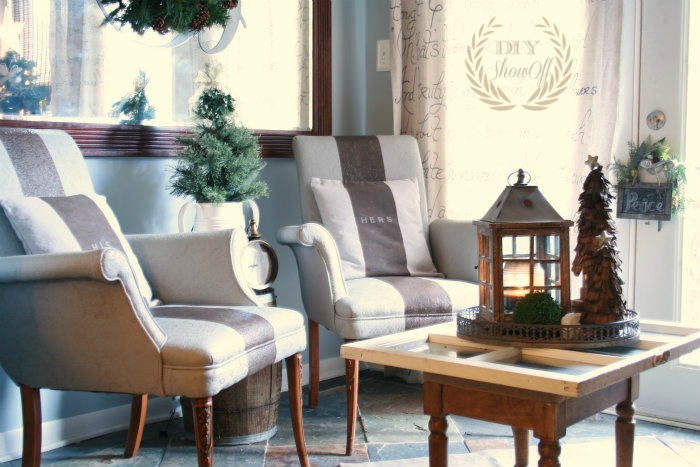 In the DIY Show Off home, decorating for Christmas starts the day after Thanksgiving. And it pretty much continues until Christmas day. I like to rearrange. It’s an addiction. I can’t clean without rearranging or redecorating either. I’m going to share a little of the Christmas decorating at our home, but just know…it’s probably going to look a little different tomorrow. Our old farmhouse doesn’t have an open floor plan. And I have a “do what I love” style. There is not one holiday decorating theme…I go with what fits the room, what has special meaning, what I have and what I like. Thankfully my husband just loves a festive environment. 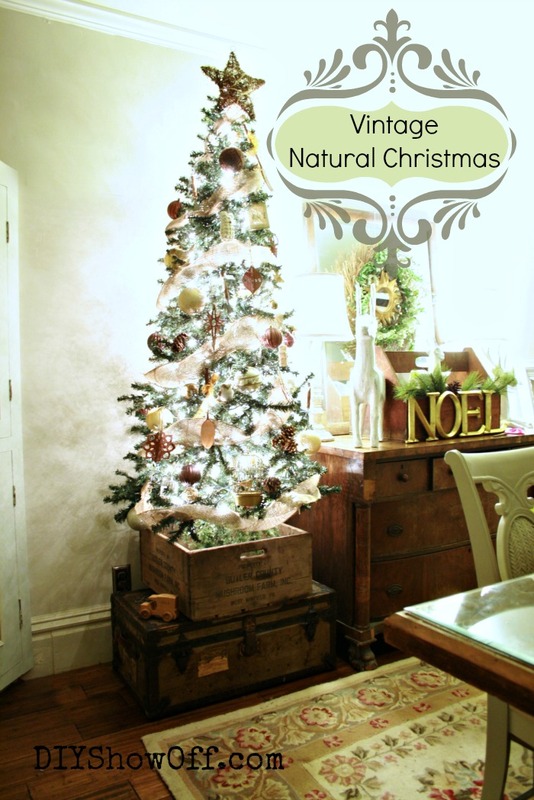 There is no wrong way to decorate, a cheerful attitude goes a long way with making a home feel like Christmas. 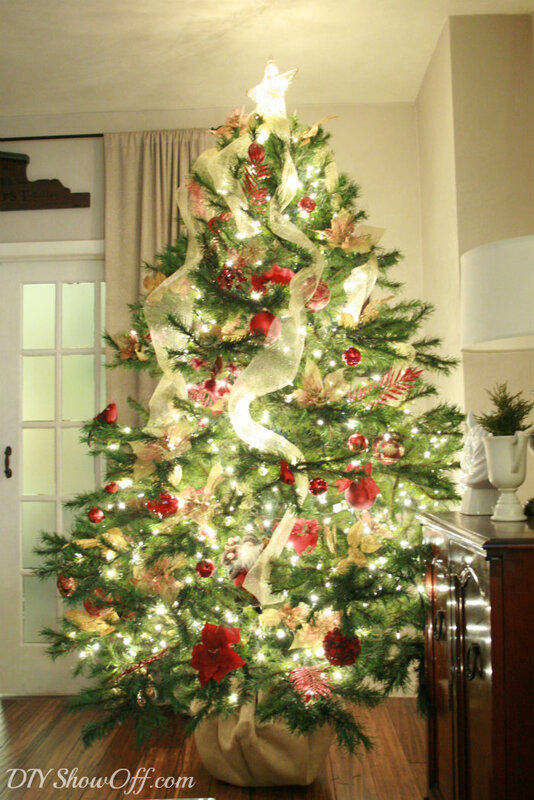 Starting in the living room, I decorate with traditional reds, greens and golds. Through French doors, the living room opens into a family room. Before our empty nest, the family room was where the girls watched tv and spent time with friends. It’s where their computers were located and the area we worked on craft projects and played games… now, I’m not sure what to do with this room but it’s under construction. I did however put the DIY room makeover on hold and holiday decorating is colorful and eclectic with a no sew ombre ruffled tree skirt, lighted starburst tree topper and DIY fun chevron reindeer games sign. Our dining room has more of a vintage, natural, rustic vibe. 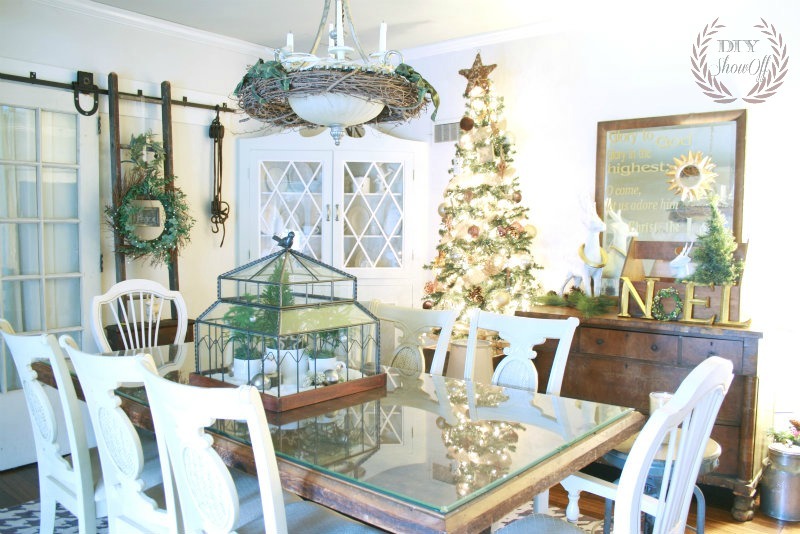 The tree in the dining room is trimmed burlap ribbon, pine cones, golds, handmade wooden ornaments, wooden serving utensils and thrift store treasures. 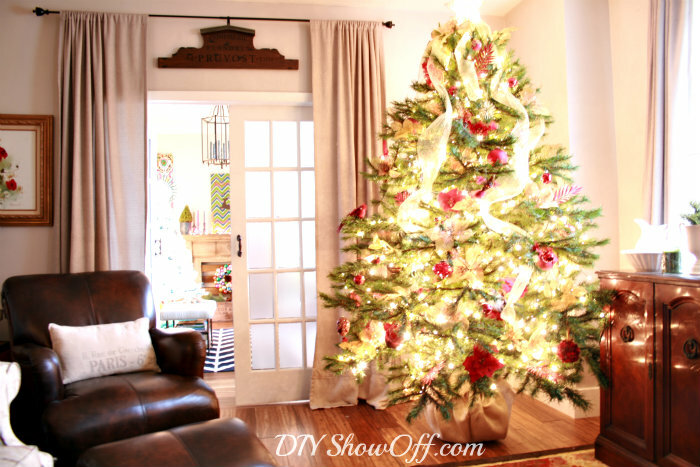 I’ll be sharing a little more at DIY Show Off over the next week along and you’re invited to stop by the weekly DIY Holiday Highlights party and the Christmas Tree Party & Contest that runs through Christmas day! Thanks so much to Beth for hosting such a fun series! Have yourself a very Merry Christmas! Isn’t that ombre Christmas skirt AMAZING?? If you see any photos you’d like to pin, please consider clicking over to Roeshel’s blog and link to the original source. If you loved touring Roeshel’s beautiful farmhouse please leave her a comment here! In case you want to visit all the previous homes on the Holiday Home Tour this week, please click over to check them out! I promise you will NOT be disappointed. Thanks so much, Beth and Roeshel, for giving us the opportunity to see all of that Christmas lovliness! I pretty much decorate up until Christmas too. I’m so inspired by this beautiful home, next year I am stepping out of the box for sure. Thank you Roeshel for letting us tour your home. Popping over to Roeshel’s to do some pinning. Can’t pin yet from Roeshels blog… you’ve got an exclusive! Thanks for this inspiring tour! Roeschel rocked it this year. So much inspiration and so many great ideas! Oh. My. Gorgeous-ness! Hello– I am bringing my gang over to your house lady– get ready! Wow did Roeshel do it right in those rooms. The Christmas trees were stunning! Thank you for sharing this amazing home! Thanks so much for the “pretty” and please, keep it coming. Right at this time of national shock and sorrow over the events of last Friday, it is so necessary to have a distraction. I actually made myself sick, and the blogs were the only thing that worked. Stunning, stunning, stunning. Love the variety of trees! Make me want to whip out a new one!! LOL. Jaw-droppingly beautiful! 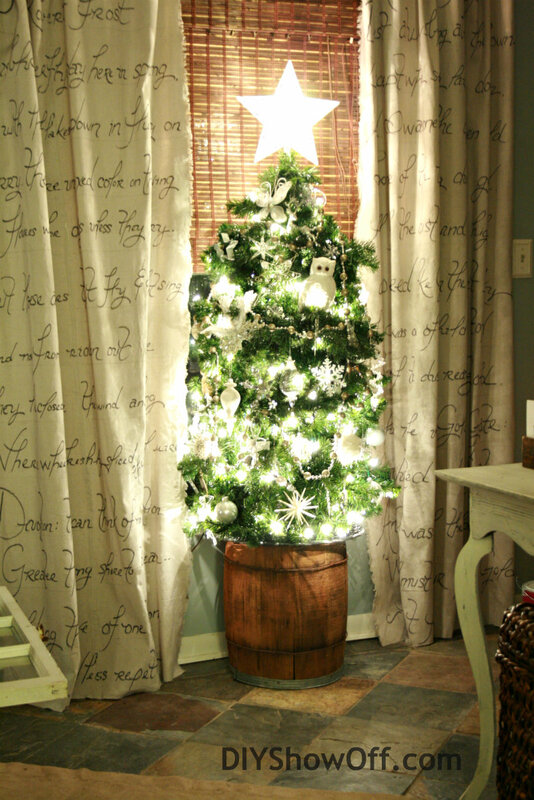 I love all the creative ways to hide the base of the Christmas trees! That new rug in her dining room adds so much…I’ll havoc to hop over to her blog and see the feature she does showing it! Roeshel, your home is so beautiful and I especially love the terrarium and NOEL signs!! There are so many beautiful textures and layers – they make want to move right in 🙂 Thanks for inviting us into your gorgeous home!!! 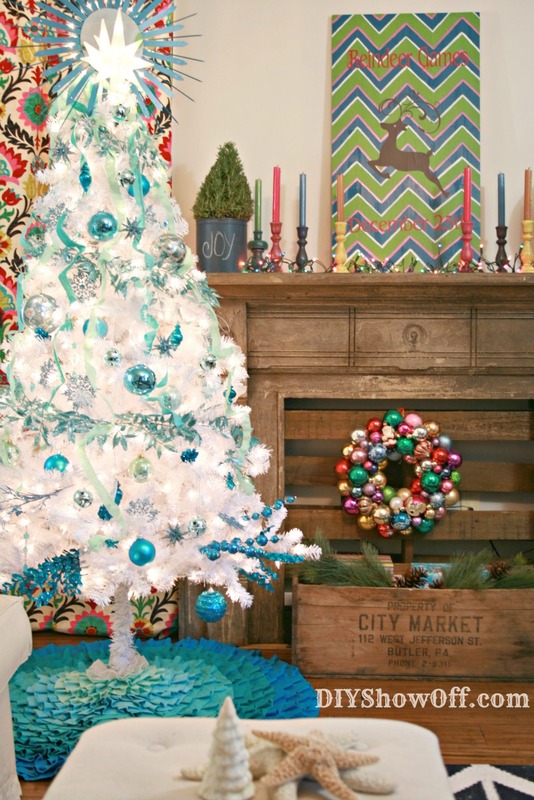 Love, love love the turquoise and white tree! Loved all the beautiful house tours, Beth. Thanks for hosting!